Natural disasters seem to be more and more common, so if you live in an area prone to floods, tsunamis, bushfires, cyclones, earthquakes or tornados you’ll want to make sure you have the necessary emergency supplies to protect you and your family. Keep your emergency supplies in a secure, easy-to-access place. Although it might seem tempting to put them away somewhere where they are out of the way, you don’t want to be climbing up to the attic if the roof is being blown off. Go for a kitchen or laundry cupboard and have a basic survival kit stored somewhere else just in case. In an emergency, it’s likely that you’ll require several basic emergency tools. Swiss Army Knives and multitools are extremely handy emergency tools and can be shoved into your pocket if you need to evacuate. It’s good to keep a brightly coloured tarpaulin or several brightly coloured garbage bags close by in case you need to attract attention. A heat source is another essential to your emergency supplies. Having at least one reflective aluminium blanket is a good idea: they fold up into a very small package, are warm, fire resistant and are a good way of signalling for attention. Light, woollen blankets and a portable camping stove are also good emergency tools. Of course, non-perishable food is an absolute must in any emergency supplies cupboard. A good guide is to have enough food to last your family for 14 days. Canned foods are always good (make sure you have an extra can opener), as are dehydrated camping meals. Dehydrated camping meals can offer nutritional value that canned foods can’t and usually only require hot water to rehydrate. Even though the your foods are non-perishable, it’s a good idea to rotate your food supplies every year or so to make sure it’s fresh enough to eat in case of an emergency. Water is extremely important, and all emergency supplies should include access to water and a good supply of water filtration devices for various situations. In many emergencies, the water supply can be cut off or become highly polluted. Investing in a few purification methods can offer peace of mind and ensure your family is safe no matter what the emergency. The SureAqua product range is a great emergency tool for most emergencies as it provides portable, potable, purified drinking water as you need it. The SureAqua aw is an ultra-portable option, which is a good idea to keep in your emergency supplies cupboard in case you need to evacuate and cannot carry water with you. The SureAqua products give you the freedom to drink from any water source and not get sick. It is also vital that you don’t forget to store some water in case your water supply gets cut off. The SureAqua Lab is a great storage device because it also acts as a water filter in case you need to grab it and run. Any disaster can take you away from your home, so it’s vital to keep some basic form of shelter in your emergency supplies kit. A lightweight tent is best, but you could even make do with a sizeable tarpaulin, some sting, and some pegs. Of course, one rarely considers that communication would ever be an issue in an emergency. However, if your mobile phone and computer break down (perish the thought) you won’t just be able to send a text or log onto Facebook and ask your friends to come and find you. Instead, you’ll need some old-school methods of communication in your emergency supplies kit. Emergency tools like a whistle, mirror, flare, compass, pencil, and paper are essential to any emergency supplies kit. With these, you can help rescuers to find you even if all technology breaks down. Of course, a basic first-aid kit and sanitary products are also vital emergency supplies. To receive our informative articles, just type in your email address below. Water quality is questioned more and more, as it should be. As towns and cities grow the demand on infrastructure becomes stretched to and past the limits. We need to be aware of the challenges and educate ourselves accordingly. This includes being prepared according for when notification of contaminated water might be made. Questions around this would include local conditions and the type of incidence that might occur and the resulting contamination that you would need to address in your water to be able to drink it safely. When familiar with the SureAqua range, you may also be able to review the volume of water that you store from a disaster preparedness angle. If you live in an area where flooding is common, you may be able to source flood water and use the SureAquaJerrycan, therefore, reducing the need to store high volume water. Our earth is covered by around 70% of water, of that 70%, only about 1% that is drinkable. Of all water being consumed by people about 95% ends up in our sewage system. As consumers of water, our water consumption is up 100% in the last 30 years. In that time, we have increased our pollution by more than 350% per person, we have removed enormous areas of forests, we have increased our heavy industry by more than 2 fold, and quadrupled the number of motor vehicles, as well as our population, is growing at a rapid rate. It is no wonder that our earth has more and more issues with challenged water quality. Many recent surveys and reports have attributed liver damage, cancer, arthritis and many other diseases less than effective water purification systems. Latest US water supply reports have shown that approximately 65% of town water supplies has some form of unacceptable (EPA levels) levels of contamination. Most town water supplies have elaborate water purification and filtration systems to remove and destroy unwelcome contaminants. Some of the main culprits in todays water impurifications include; Giardia lamblia, Cryptosporidium, Leptospira (leptospirosis), Vibrio cholerae, salmonella, Clostridium botulinum (botulism), pathogenic viruses, the larvae of flukes. Each can have devastating, if not fatal effects on humans if not effectively treated..
What about heavy metals is water? Heavy metals in water can lead to some very serious side effects including brain damage, development of autoimmunity, rheumatoid arthritis, kidney, and nervous system diseases. When we refer to heavy metals we normally refer to toxic metals. These, in most, originate from industrial & urban runoff; that is from roads and house roofs; factory outputs; industrial wastes, garbage tips, coal burning, waste incinerators, mining. There are over 50 plus heavy metals elements. Of that, there are 18 that are considered toxic. Mercury, selenium lead, cadmium, chromium, thallium, and arsenic are the worst of the heavy toxic metals that should be avoided at all costs. Other heavy metals that are required in very small dosages, 1 µg or less per day by the human body include zinc, copper, and chromium, though in large dosages can be fatal. These heavy toxic metals are considered as dangerous as they bioaccumulate in the body. That is, they build up faster than they are removed through human excretion, This build up that causes much of the damage to humans. Even though toxic heavy metals are a lesser concern compared to bacteria followed by viruses, it should not be discounted as there have been some majors water disasters attributed to heavy metals. Some more prevalent ones have been in France (Sandoz), Spain (Coto de Donana) and Australia (Sydney). 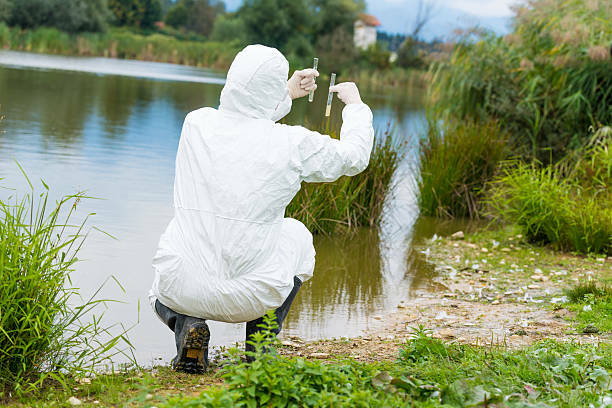 It’s not only the water you should be concerned about drinking, fruit, vegetable, grains, seafood, and shellfish can also contain toxic metals and bacteria as the water used to grow the plants or the seafood is contaminated and polluted. How does contamination get into our water supplies?